Many online databases allow you to automatically export citations to EndNote Web so you don't have to manually enter them. However, it's important to know how to enter and edit citations, as you'll need to double-check that any automatic imports are correct, and make sure they conform to the capitalization standards of your citation style. 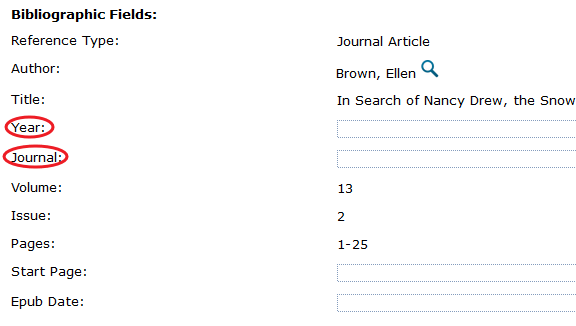 The sections below explore how to export citations to EndNote Web from the Library's most popular database platforms. A video tutorial on importing references from EbscoHost databases is also available. 1. Make sure that you have EndNote Web open and are logged in. 2. 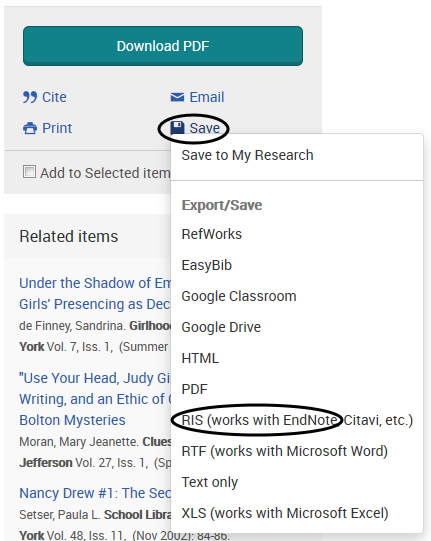 On the article page in EbscoHost, click "Export" in the menubar on the right, then choose "Direct Export to EndNote Web" and click "Save." 3. A new window will open confirming the citation has been imported to EndNote Web. Open the new reference and make sure the information is complete and correct, and capitalized correctly per your citation style. A video tutorial on importing references from JSTOR is also available. 2. In the popup window, click "Export to a RIS file" under "Export Citation." Save the resulting .ris file to a convenient location, such as the desktop or your downloads folder. 3. In EndNote Web, hover over "Collect" in the top menubar, then click "Import References." 4. Click the Browse button and navigate to the .ris file you just saved. Set the import option to "JSTOR." You may add the item to a group; if you don't use groups, simply add it to "Unfiled." 5. Open the newly imported reference in EndNote (below). Make sure all necessary fields are filled, and correct the capitalization according to your citation style (bottom). 1. 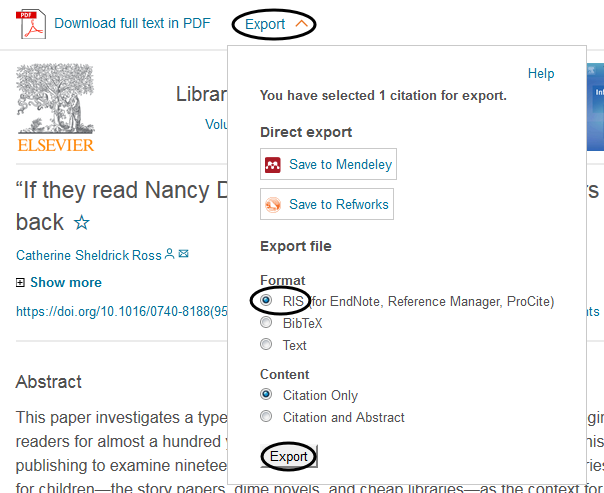 In ScienceDirect, click the "Export" button at the top of the article page and choose "RIS" under "Format." Click "Export" at the bottom of the pop-up window and save the .ris file somewhere convenient, such as the desktop or your downloads folder. 2. In EndNote Web, hover over "Collect" in the top menubar, then click "Import References." 3. Click the Browse button and navigate to the .ris file you just saved. Set the import option to "ScienceDirect" or "Scopus." You may add the item to a group; if you don't use groups, simply add it to "Unfiled." 4. Open the newly imported reference in EndNote. Make sure all necessary fields are filled, and correct the capitalization according to your citation style. A video tutorial on importing references from ProQuest databases is also available. 3. Click the Browse button and navigate to the .ris file you just saved. 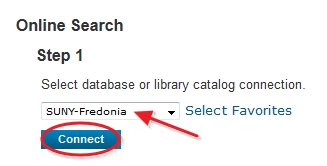 Set the import option to "ProQuest." You may add the item to a group; if you don't use groups, simply add it to "Unfiled." Please note: This method of importing references is only recommended if you have a physical book from Reed Library. It is not recommended as a method of finding books in the Library, and it will not find resources from any database but the Library catalog itself. In addition, this method only works while on campus. 1. In EndNote Web, click on "Collect" in the top menubar. 2. The "Online Search" page appears. 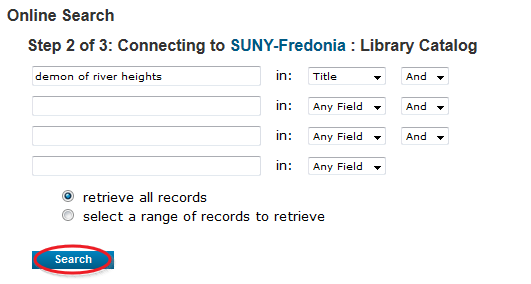 Choose "SUNY-Fredonia" from the drop-down menu and click Connect. 3. Enter your search terms, then click Search. 4. 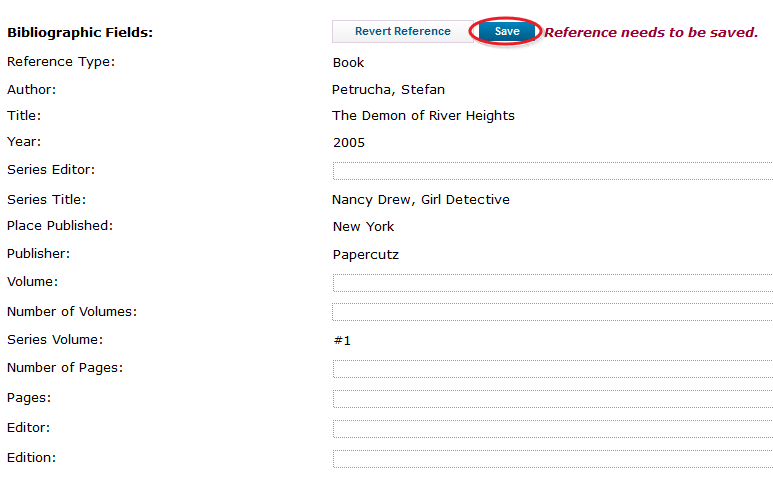 Click the title of the item to auto-fill a new reference entry form. 5. Make any necessary corrections to the form and click Save.